P was in Italy for a day of meetings, and his flight got in mid-morning the day before. So he had all of Wednesday afternoon to recover from the flight and enjoy the fabulous area of Franciacorta near Lake Iseo...northeast of Milan. His plan was to put in a few miles on the bike, get a lot of sunshine to combat jetlag, and enjoy a few hours where he didn't have to work. And make no mistake, it was a beautiful day on Lago d'Iseo. And thanks to his holel, the Relais Franciacorta, he had a great new rental bike--a brand-spanking new all carbon Trek equipped with the right pedals to match his shoes...sweet. The ride along the east side of Lago d'Iseo is gorgeous, from Clusane to Pisogne. Snow covered Alps at the heads of the valleys, deep blue lake, ancient churches and castles. Bright sunshine, a cool breeze that had the windsurfers out to play. A perfect day on the bike. At Pisogne I turned around, heading back into the sun and wind. I was taking it easy, not riding too hard, and enjoying the sights. I was also being just a little careful because I didn't have a helmet, and I didn't know the roads so well. In fact, I was pretty focused, making sure I found the right turn off to go up the tiny road to Colombaro and the hotel. But I found it, and knew I had only about a mile to go. Now I was riding up through the town on a narrow cobblestone street for a block or so, and I saw a group of four or five older poeple walking together down the middle of the street. There was a stack of shipping pallets off to the right, but plenty of room for me to ease over and give the pedestrians a little more rooms. I never like to ride too close to pedestrians, as it makes them uncomfortable. What I didn't see, as I was looking into the sun, was a small curb on the right side of the pavement. As I drifted over to the right the bike lurched and threw me headlong into the shipping pallets. I remember thinking that I still had control of the bike, but there was no room to make a correction before I hit the pallets. It's not good. There is blood everywhere, and I know that I have really done some damage to the area over my right eye. Blood was splattering the pavement, and everyone was crowding around to help. They got me seated on the side of the road, brought me yards of clean paper towels to apply pressure to my head. After some conversation limited by my rudimentary Italian (they were sweet enough to compliment me on it, while they struggled to understand!) they pulled out cell phones and called both my hotel and an ambulance. And make no mistake, it's clear I need to go to the hospital. A few minutes later, the ambulance appears, and checks me over. I have no symptoms of concussion or neck injury, but they take no chances. I do point out that I am probably a bit dehydrated from my bike ride, and the agree. Ten or fifteen minutes later I am strapped down tight, loading in the ambulance, and racing off the hospital, siren wailing. Meanwhille, back at the hotel, the staff is kicking into high gear. They call my clients, the Consorzio di Franciacorta who send Carlotta, one of their staff, to the hospital to check on me. They call the bike shop owner, who also comes to the hospital. (they bike had a bent front wheel, but no other damage, luckily. They call the driver who picked me up earlier at the airport, and he shows up as well. They called everyone they could think of. And they all came to the hospital to check on me. Amazing. Back at the hospital, I am admitted and placed on a gurney. The good news is that I am code green, meaning no major injuries. The bad news is that I am code green, and will have to wait my turn for treatment, It turns out to be about an hour and half before they start stitching me up. 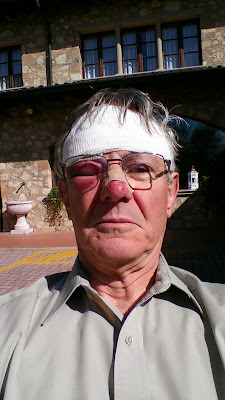 Within a few minutes, I was patched up (about twenty stitches in total, and my right eye swollen completely shut) and ready to be released, complete with a full medical history in Italian for me to share with my doctors back home. And a warning to use a helmet. They ran through the whole document with Carlotta, to make sure that I understood everything. The biggest concern was if I were tp show any signs of concussion, I should call them immediately. The ambulance driver stopped in to make sure I was OK, and ran through the instructions with me again. And then he presented me with the bill for all of this: 91.39 euros. Makes you wonder. Carlotta drove me back to the hotel, and stopped at a pharmacy on the way to get the antibiotics and bandages I'll need. And she delivered the whole medical history to the hotel staff, who promised to check in on me and report and symptoms. Because of the antibiotics, I was only allowed to eat a bland meal, and so the fabulous restaurant at Relais Franciacorta made me a nice plate of pasta with olive oil and Parmesan cheese. The next morning the hotel staff checked on me to make sure I felt OK, and Carlotta arrived to take me to my meeting. They gave me the rest of the day off to rest, and arranged for their driver to pick me up the next morning and get me to the airport. All according to plan. Everyone, from the old folks who were walking on the street, to the employees of the local company who owned the pallets, to the hotel to the Consorzio di Franciacorta, to the ambulance crew, to the driver, was as helpful and caring as possible. If it hadn't been for the accident, it would have been a wonderful experience. If I had hit those pallets an inch lower I would have lost my right eye. And had I hit the pallets head on, instead of a glacing blow, it would have been much, much worse. I was also unlucky. It was a tough combination of ingredients that created the accident. And if the pallets had been ten feet further away I would have missed them entirely and ridden on. And if I had been weaing a helmet, the damage would have been negligible. But I am fine, thank you. I didn't sleep great that last night in Italy because of jet lag, but I ate a healthy breakfast and had no problems on the flights home. I am more or less good to go--although I look like hell, and that won't change soon. If you want to see the gory photo, scroll down below. If you don't want to see it, stop at the end of the text here. Wear a helmet.stupid! With a helmet I would have walked away from this crash. I have ridden over 52,000 miles on a bike in the last ten years or so, and only ridden without a helmet about twice, And that's all it took. Stay at a good hotel. They were solicitous beyond belief, and efficient as well. I felt fully and totally cared for. Have friends and clients in Italy. They were wonderful, and really went out of their way to make sure that I was OK.